It arrived a couple of days ago. A really good game! Really nice tsampikos. 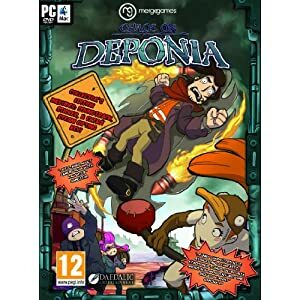 I got Deponia a couple of weeks ago. It's in my to play now. Well,actually it's Chaos on Deponia, the secomd part of the trilogy.A retail version is now available. I got Chaos on Deponia also but it's just a download. I like the Gord@k box also, very cool. Shame about the shrinkwrap causing the box to fold in though. I have that with the Stupid Invaders box. Recently got the boxed version of Yesterday and KGB Unleashed. Well, I didn't have to spend, spend, spend on this one! I recently upgraded my motherboard, RAM, processor and video card. I got a $50 coupon for a free copy of Metro Last Light with my video card. It's turning out to be a great FPS. It's based on a novel, Metro 2033, and is an "after the apocalypse" setting where the surviving humans live in the old Metro underground rail system in Russia. Sounds like you have some good gaming ahead, hatshepsut! I heard about that game , Drac . Supposed to make your video card(s) cry so to speak . I have Metro 2033 . Wasn't too bad a game . So far my Superclocked EVGA GTX 660Ti hasn't missed a beat - even on full settings with about a gazillion monsters coming at me from all sides... gotta love the 4-chamber shotgun! Ha ha ! Sounds like a fun game . There is a game out called Rage . One I'd like to check out . My card should be able to handle both mentioned without a lot of trouble , or getting too hot . Draclvr a coupon for a free game is always nice. Metro 2033 sounds like an interesting game. Yep I think I have alot of good gaming ahead. Now just to find the time. I started The Five Cores but I think it's going to be a long game. Hopping back & forth between Shadow Ops : Red Mercury , Diablo 2 , & Darkness Within : Loath Nolder . May just play both Darkness Within games back to back . Which thread do we use? Anyway I have a photo to show you. Enjoy. Thanks, Mullane, for posting on this thread today! And I have a special reason for thanking you because I have a very strange problem and this link is the only one I have to reach Adventure Point. Maybe some of you have noticed that I haven't been here in ages, but the fact is that I have been trying but all I get is a blue screen. I thought that Gelert was making changes and have been patiently (and sometimes not so patiently) waiting for the new format, wondering what it would be that it was taking so long! So now what do I do to get back? I hope the answer isn't, "Get a new computer." mindysue, have you tried clearing out your browser cache? Mullane....ALICE???? YOWZERS!!! Fabulous find.That is all I have to say about that. Mindy..do you use Internet Explorer or Firefox? To answer as best as I can: I use Internet Explorer, but I also have Mozilla Firefox. I don't know anything about a browser cache. All I know about Firefox is that it is in my list of Programs. For now, I'm saving the email "spend, spend ..." link, which seems to be working just fine. Not to rain on your parade , but , using Internet Explorer for anything , is like ringing the dinner bell for a hacker/malware/virus writer . IE is slow , bloated , and full of security issues . I would advise to use Firefox , Chrome , Kmeleon , Opera , anything but Internet Explorer . Try coming here to the Point with another browser , see if you have that same problem . If you do not , your problem has been solved . Faust..That's why I asked. It could very easily be the problem.I use Fire Fox now. Used IE for years and will never go back . I thought that may have been the case , Ang . Especially for those using XP , Internet Explorer is asking for trouble . I'm trying, but I'm not sure of changing to Firefox. It seems to me that it will wipe out everything I already have and I might be left with too much new stuff to learn. Like what is pdf? I haven't a clue! Well, I do have a definition by MaG from years ago that says pdf stands for portable document format (Duh!) and is an "extension used by Adobe Acrobat and is read using Adobe reader" ... hmm. I never did understand it way back then, and I understand it even less now. You would be safer using Firefox anyway . Pdf files can be used with any pdf program available , not just Adobe Acrobat . A few other pdf readers would be PDF Xchange (I use this) , Foxit reader , and Nitro pdf reader . Okay, I now have Mozilla Firefox for my browser and some things work and some don't. I'm trying to find my way around and somehow I have made it here. For now anyway. I'm not sure I will be able to get back after I leave. I was actually trying to reach Big Fish, so how I made it here instead I have no idea! I feel like I'm playing some new kind of adventure game, you know, a point-and-click and see what happens. So far Firefox is proving to be one mell of a hess and whenever I try to download my usual stuff it pops up with a message saying it's a "binary file" and gives me some choices to click, but no matter which choice I pick, I get nowhere ... at least nothing happens that I can see, no hourglass, nothing to show that anything is loading. Today, I can't even download my Peter's Jigsaws and I've been doing the Jigsaws twice a week for YEARS, have worked over 700 puzzles! I've been trying to learn how to use Mozilla Firefox and about all I've learned so far is that it is free, sheesh. Where do I go to learn how to download? If you would , could you start another thread in the tech help section about your trouble with Firefox ? One of us will amble along to help you out , no worries .